Bus Rental: Reasons To Rent A Charter Bus For A Wedding! 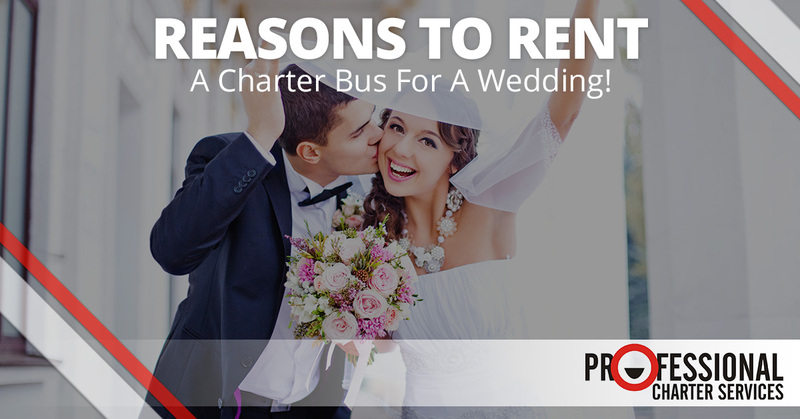 Reasons To Rent A Charter Bus For A Wedding! Wedding planning is one of the most exciting, and occasionally stressful, events that you get to experience as a couple. There is a seemingly endless amount of details to finalize, guests to invite, and other tasks to do before the big day arrives. From getting the perfect dress, booking a beautiful venue, and finding delicious food and wedding cake, there are a lot of factors that contribute to the perfect wedding day. However, what many brides and grooms tend to forget about is how they, and their guests, will get from one destination to the next, and renting a bus for a wedding is one of the best ways to do so. With most wedding ceremonies and receptions now being at two different locations, getting from one destination to the next in a timely fashion is essential. The bridal party and guests not only need to find a method of transportation to the wedding and reception but also back to their hotels and lodging accommodations after a night of celebration has ended. Private buses, are both a convenient and economical transportation method to ensure you and your guests arrive on and in this article we are going to cover some of the reasons why renting a private bus or shuttle for your big day is a great idea! A limo rental has been the most traditional wedding transportation method for the bridal party, but they can be extremely expensive. Generally, after the bride and groom stay “ I do”, the wedding party piles into a limo to go off and take pictures before the reception. While a limo may be a great option for small, more traditional weddings, there are more modern and creative ways to transport a party from point A to point B. Charter bus rentals are a great alternative to limos. Not only do they have more room, but they can easily be turned into a fun party bus, which we will dive into later on. When planning a wedding, it can be difficult to save money, and with couples spending between an average of $19,323 and $32,205, the last thing couples want to dish out money for is transportation options. If you are having a wedding with a large number of guests from a particular city, organizing group transportation can help save you and your guest time, money, and hassle. Renting a private bus is a great way to ensure that you and your guests arrive at the same place on time. What’s more, you can save even more money by securing a group rate at a hotel and offer them the ability to buy into your group transportation option. Even if you don’t need transportation options for out of town guests and just need to transport guests from the hotel to the ceremony or from your reception back to the hotel, renting a private bus is a great option. Believe it or not, renting private buses or shuttles can make your wedding day run much smoother. Transportation to and from venues is an important part of the day, and hiring a charter service is a great way to ensure that it is taken care of. Let’s take a deeper look into how charter services can make transportation accommodations much smoother. It is likely that there are many friends, family, and guests traveling from various towns, cities, and states to watch your special day. Many of them will have to stay in a hotel. Travel expenses can start to quickly add up for your guests, so in order to be considerate and prevent any issues on your wedding day, set up transportation from the hotel they are staying at to the wedding destination. While certain hotels may provide complimentary shuttle buses, they usually run on their own schedules and have limited proximity and space. Not to mention, most hotel shuttle services only driving within a three to five mile radius, which may mean your ceremony and reception venues are not accessible. A charter bus or shuttle bus will help ensure that your guests arrive safely and on time to the wedding and reception, as well as back to their hotel after a night of celebrating the newlyweds. As mentioned, be sure to set up a group rate at a hotel to ensure your guests are together. This will make transporting them to the venues easier and more efficient. Guests and members of the bridal party traveling in multiple vehicles can quickly get confusing and overwhelming. Renting a private bus ensures that no matter who you are transporting, whether it be family members, a bridal party, or other guests, that they all arrive together, safe, and on time for your special day. Plus, f you are getting married at a venue where parking is limited or will require your guests to pay a parking fee, renting a charter bus for your wedding transportation becomes a more efficient idea. Getting married is a special event and you want your friends, family, and guests to only be worried about celebrating your marriage! As we briefly mentioned above, charter or shuttle buses are a great way for a bridal party to arrive at their destination in style. Limos are small and can quickly become crowded. Charter buses have the space, comfort, and convenience to transfer you and your entourage to each destination, from the venue, photo spots, the reception, and the hotel. If you are having a wedding in an area that is unfamiliar to most guests, getting there can be stressful for them. Setting up a charter service will make it easy for your guests to get to and from the airport to their hotel and take a lot of stress off of their shoulders. Plus, they will ensure that your guests will arrive to your wedding safely and on time. As you can see, there are plenty of reasons to book a charter service for your special day. Finding the right charter or shuttle bus will ensure the transportation side of your wedding day is handled for you and your guests. Need A Wedding Bus Rental In Northern California? If you are considering getting a wedding shuttle or bus for your special day in Northern California, contact Professional Charter Services! We are dedicated to providing safe, comfortable, reliable and cost-effective charter bus transportation, especially for weddings! To learn more about how our charter buses and mini shuttles in San Francisco can make your wedding day go smoother, contact one of our friendly representatives today to request a free travel quote.